Approximately fourteen percent of Americans suffer from some degree of kidney disease. The highest populous of people in this group are those of the elderly community. Those who suffer from Chronic Kidney Disease, and reach stage 5 (end-stage renal disease), require dialysis or a transplant. Because surgery and other risks are higher when people are above a certain age, most elderly people who suffer from end-stage renal disease must get dialysis. When living in a skilled nursing facility, and participating in dialysis, residents must schedule their precious time, find transportation, and spend long hours receiving treatment, and then schedule transportation home. This is why many skilled nursing facilities are beginning to offer dialysis on-site. Dialysis is the process of using a machine to filter out water from the kidneys. When kidneys lose function, they are unable to filter the water themselves. 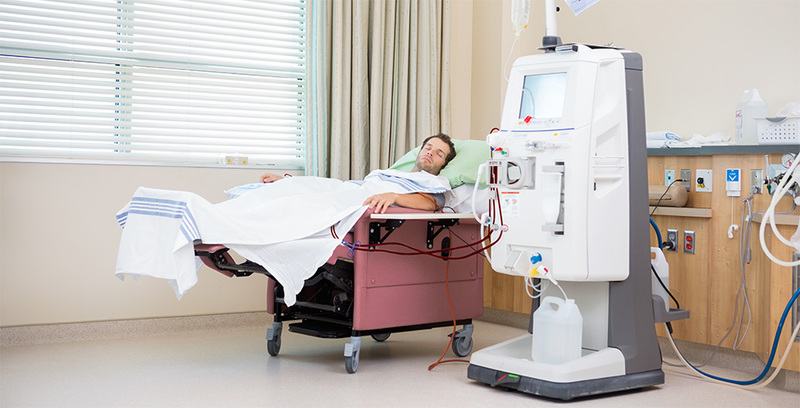 There are two types of dialysis for those with kidney failure. Hemodialysis and peritoneal dialysis. Hemodialysis is the type that skilled nursing facilities are offering. When skilled nursing facilities offer dialysis, the residents get the benefit of staying on-site, eliminating the commute time, waiting room time, and inconvenience. Residents also get the benefit of staying in a familiar, quiet, comfortable place, which is an important amenity for elderly residents, especially those who are recovering from surgery, injury, or suffer from memory loss. In-house dialysis is often complex, so many skilled nursing facilities are opting to partner with dialysis centers and have a registered nurse travel to the facility a few times a week to complete the dialysis for the residents. When skilled nursing facilities operate their own dialysis care without partners, there are many rules and regulations they must follow. The skilled nursing facility must “ensure that an ESRD facility, maintains direct responsibility for the dialysis-related care and services provided to the nursing home resident consistent with the ESRD Conditions for Coverage requirements as well as the terms of an applicable agreement with the nursing home.” Requirements, education, and training are closely monitored and regulated. The three most important regulations for dialysis at skilled nursing facilities are: onsite supervision of dialysis must be provided by a registered nurse; qualified, trained personnel must be present for the entire dialysis treatment, with the ability to see the patient; and if the skilled nursing facility is, for whatever reason, unable to provide scheduled dialysis for a resident, the nursing facility must notify a dialysis center and get the resident dialysis off-site in order to avoid delays or cancellation in treatment. Offering in-house dialysis for residents improves the quality of their life. As the quality of life improves, residents increase their fulfillment and functional ability. Skilled nursing facilities strive to provide the highest quality of care, and offering in-house dialysis is another step towards improving the lives of residents.